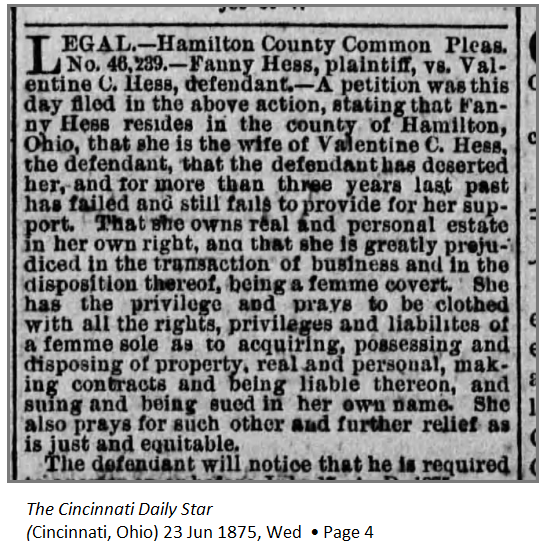 The discussion of the origin of the marriage record for Valentine C. Hess in Hamilton County, Ohio, was not just academic fodder for a blog post (Where Was Valentine’s Marriage Record From: Part I and II). It was also not just for the creation of an accurate citation to the record. It was about analyzing that record and understanding it so that it could be evaluated. Because how that “Charles” got in the marriage record image matters–at least to me and my search for dead people. There’s a chance the Valentine C. Hess who married in Hamilton County, Ohio, is 1852 is the one I am looking for. The one I’m looking for has a middle name of Christian and not Charles. I’m trying to locate a man who was born Johann Christian Valentine Hess in Wohlmuthausen, Thuringen, Germany, on 3 December 1827 to Ernestine Trautvetter and Caspar Hess. Johann appears to have been his baptismal name and not the name by which he was actually referred. Valentine is mentioned along with his brother William (Wilhelm) and sister Wilhelmina Rothweiler in an 1870-era probate case in Hancock County, Illinois, when the estate of their uncle Michael Trautvetter was being settled. The probate refers to them as siblings and that sibling relationship is also documented in the church records for Wohlmuthausen where William was born in 1834 and Wilhelmina was born in 1828. The relationship among the three is well-documented although Wilhelmina is the only one that can actually be found in the United States after immigration. 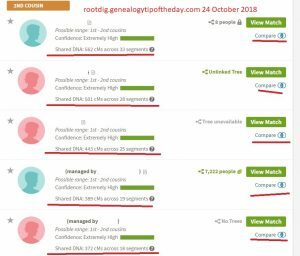 She’s the only one who is well-documented individually, but no record on her in the United States mentions her brothers (except the Michael Trautvetter probat case). The probate record for Michael Trautvetter indicated that Valentine could not be located, but that he was last known to have lived in Cincinnati, Ohio., when the final estate report and accounting was filed. Valentine could not be found and his inheritance was deposited with the Hancock County, Illinois, treasurer. It could still be there. Fanny is seeking to be declared a femme sole. She wants to be able to execute legal documents without her husband. This is completely understandable. The legal notice does not make it clear if she is also petitioning for dissolution of her marriage to Valentine. More work needs to be done on the couple referenced in the legal notice–there’s no doubt of that. But this reference looks promising and worth following up. The Valentine in the court case apparently deserted his wife around the same time the probate of Michael Trautvetter was being settled up in Illinois. The “three years” referenced in the legal notice may not actually have been the amount of time Valentine C. had “abandoned” Fanny or been absent. It could have been the legal minimum required before legal action could start. It would be safe to say that the apparent separation had been for three years or more. Fanny could have easily waited longer than three years to begin the legal action. It’s also likely that the desire to sell some property was the impetus for her lawsuit. The time period dovetails with when “my Valentine” could not be found in, but was last known to have been living in Cincinnati, Ohio. The court case may make additional reference to where Valentine was believed to have been living when the legal action was instigated. It may provide additional identifying information about Valentine that could help to establish whether or not he is the person for whom I was looking. Which still has me wondering: was that Charles in the marriage record for this couple a mistake or was it actually Charles? Could it be Christian instead? Michael, it could also be that for some reason, Valentine “anglicized” Christian into Charles; that is what one of my German ancestors did. That’s a good point, too. I had not really considered that–I was too concerned about “how” the record was created. I may even have to blog about that. It’s a good reminder about jumping to conclusions. Thanks!